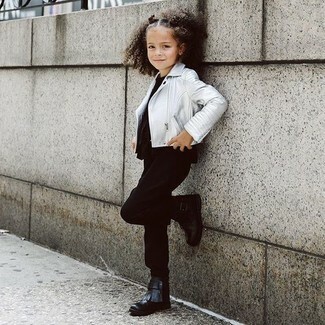 Go for a Billieblush silver metalic biker jacket with blue faux fur lining and black trousers for your daughter for a comfortable outfit that's also put together nicely. As far as footwear is concerned, suggest that your little girl opt for a pair of black boots. 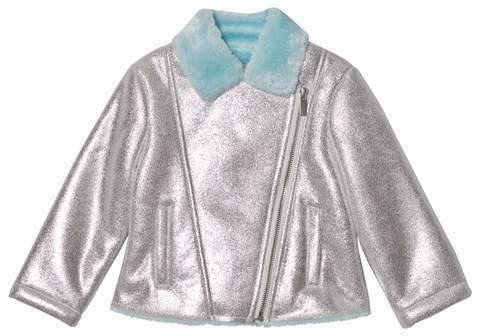 Help your kid look fashionable by suggesting that she dress in a silver leather jacket and a grey star print skirt. This style is complemented perfectly with pink leather boots. 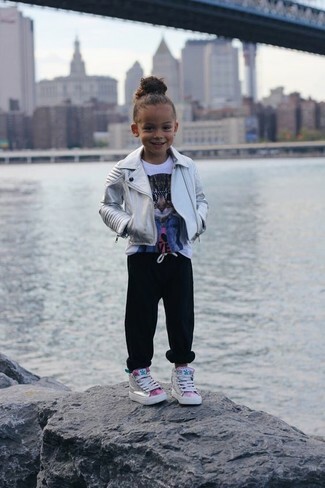 Suggest that your little fashionista wear a Billieblush silver metalic biker jacket with blue faux fur lining and black sweatpants for a fun day out at the playground. This getup is complemented wonderfully with silver sneakers.